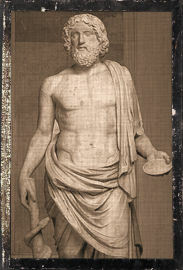 Blessing: Asklepios is even more concerned with health and healing than his father, Apollo. He comes to people in their dreams, and works miracle cures. He shows people how to live better lives, how to be more fit and energetic. Spiritual healing and psychology are also his concern. All of his skills he gladly shares with humankind, teaching us the secrets of health, and aiding us as we help our fellows. Equated With: Imouthes (Imhotep), Serapis, Apollon, Paian. Ways to honor: Live a healthy life. Be mindful of what you eat, and its affects on your body. Exercise. Learn about vitamins and alternative medicine. Explore Reiki and incubation. Visit the sick. Donate time or money to medical research and treatment. There’s a thesis about Asklepios and his cult available for viewing.